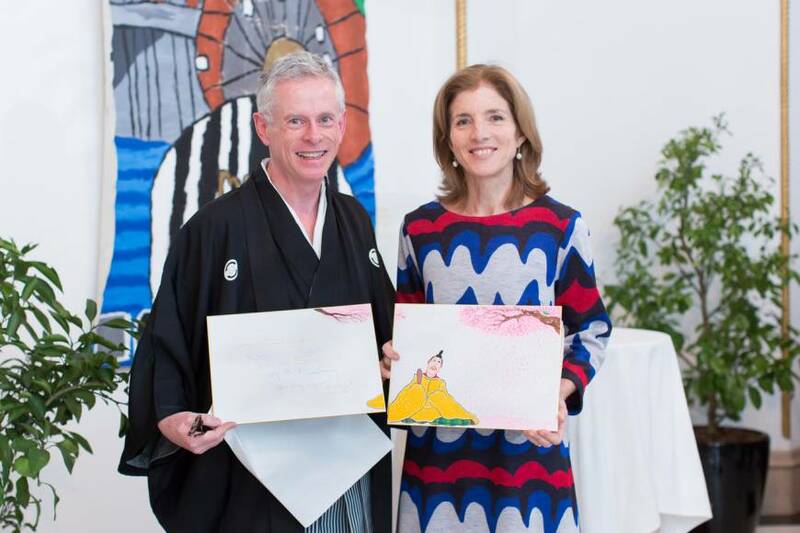 Well played: Peter MacMillan presents a specially made image of poem cards, featuring the Kennedy family tartan check in the costume of the poet, to Ambassador Caroline Kennedy at the U.S. Embassy in Tokyo in January. 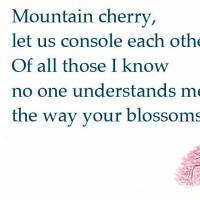 Classical Japanese poetry on playing cards — in English? It seems like an odd mix. But when you add tales of love and betrayal and brilliant translation, you get a heart-thumping card game like no other. MacMillan’s idea for his version of the karuta (Japanese playing card) game began to form after he translated the classical anthology of Japanese waka poems “Ogura Hyakunin Isshu” (“One Hundred Poems, One Poem Each”). This was published by Columbia University Press in 2008 and garnered MacMillan several top translation prizes. His other translations include “The Tales of Ise,” which was published by Penguin Books in 2016 and was nominated for the PEN International Poetry Translation Prize. For the card game, MacMillan recently completed a new translation, “Eigo de Yomu Hyakunin Isshu,” which was published by Bungei Shunju in April this year. Penguin Books will publish the English edition in March 2018. The 100 waka that make up “One Hundred Poems, One Poem Each” were assembled and edited in the 13th century by Fujiwara no Teika, one of Japan’s greatest poets and editors. The card game has 200 cards per deck: 100 torifuda (playing cards) and 100 yomifuda (reading cards). Each yomifuda contains a complete waka — a poetic form consisting of 31 syllables arranged in a 5-7-5-7-7 pattern. It also has an illustration, traditionally of the poet who wrote the poem. The corresponding torifuda contains only the second half of the poems (the final 7-7 segments). In official Japanese tournaments, 50 randomly selected torifuda are divided equally between two competitors. Before the game starts, each player arranges the 25 cards face up in front of him or her. 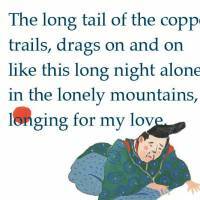 A third member, the reciter, then begins by picking a yomifuda from the deck and reading out the complete poem. The players then compete to find, as quickly as possible, the card with the last two lines of the poem. This is repeated, with the winner being the person who accumlates the most cards by the end of the game. 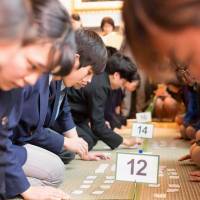 Competitive karuta requires agility and speed, as well as memory skills. It is estimated that every year around 1 million people play the game, which is traditionally played during New Year celebrations. A long-term resident of Japan, MacMillan is not only a translator but also a poet, artist and Japanese scholar — a combination that has helped him create his unique version of the card game. He commissioned artist Yasushi Yokoiyama to paint the 100 cards with the portraits of the poets in the standard card format, but incorporated some highly original innovations. For example, normally only portraits of the poets appear on the reading cards, but he directed the artist to also incorporate landscapes and motifs of animals and flowers that feature in the poems. Moreover, unlike traditional sets, which have the image on the reading card only, MacMillan’s cards split the artistic compositions, with half on the reading card and half on the playing card. Testing the cards has been key to the game’s success. “We did lots of experiments on the card thickness, size, style and ease of use,” says MacMillan, going on to explain that demonstration and testing events were held at The University of Tokyo, Nishimachi International School and at the Kanagawa Prefectural Yokosuka High School. The world’s first competition using his cards was also held at U.S. Ambassador Caroline Kennedy’s official residence in January. Overseas interest shouldn’t be surprising as karuta was originally inspired by a foreign import. Portuguese missionaries and traders introduced their playing cards, called carta, to Japan in the 1500s. 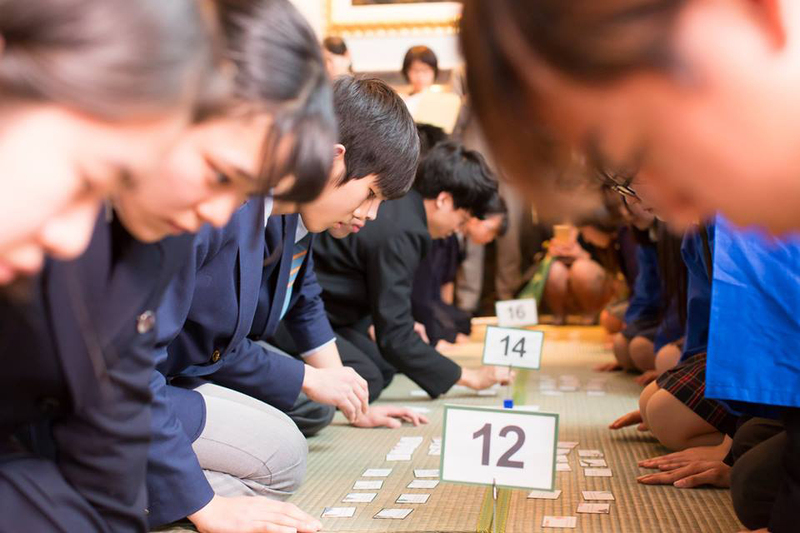 Card games have now come full circle with MacMillan’s English-language karuta and a series of tournaments scheduled this year in several countries, including the U.K., Finland and Ireland, where a national championship will be held in December. 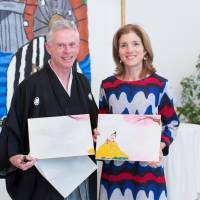 Japanese embassies in Ireland and the U.K. and the Japan Foundation are offering promotional support. “It is the first time in history that a national championship will be held outside of Japan,” says MacMillan, who is himself an Irishman. Next up for MacMillan is a boxed karuta set that he’s producing with support from Isetan Mitsukoshi and Toyoko Inn, and a lecture tour and game play in the United States.